Something extraordinary has taken place and is taking place in Northern Ireland. Something very powerful indeed. After decades of troubles the wholly unexpected coalition of the two extremes in the province, the Sinn Fein and the DUP has taken place (originally with the Reverend Paisley as First Minister (now replaced by Peter Robinson) and Martin McGuinness as Deputy First Minister). However, it would always have been all too easy to despair of any resolution of the tribal politics of the province and Northern Ireland also has of course many similarities to the communal divide of India and the peacemakers of Northern Ireland all along faced in the Protestant/Catholic divide just the same sort of challenge as Mohandas Gandhi did in his prolonged struggle against the force of Hindu/Muslim communalism; which periodically grips India. Northern Ireland was always a Gandhian challenge and sometimes we forget how much of Gandhi’s struggle was one against terrorism. It was a struggle that did cost him his life. Clearly the Gandhi Foundation wanted to celebrate, indeed rejoice, in the triumph of non-violence over violence. Of course, key to the recent political truce was the decommissioning process. Here there was a critical barrier to be overcome. No member of the IRA could afford to be photographed handing in their weapons – this according to their military code is a treasonable offence and so another solution had to be found. That was through the witness statements to the handing in of weapons to trusted representatives of the two communities. The men asked to take on this role were the Reverend Harold Good and Father Alex Reid who acted as clerical witnesses during General John de Chastelain’s disarmament process. This act of being representatives of the two communities and overseeing the disarmament requires a great deal of Trust, a very uncommon trust in today’s world which strives towards transparency, which in some circumstances is a very good thing but also implies a lack of trust. So literally these two men have been trusted by the rest of the world and especially the sectarian parties of Northern Ireland, just on their say so, to have told the truth. Otherwise the whole process would not have progressed. A heavy responsibility indeed. ‘It’s wonderful to know we have such people of faith as Rev. 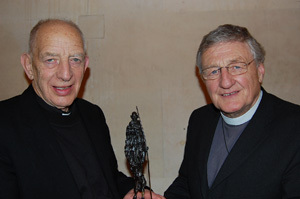 Good and Father Alec helping to make peace between the people of Northern Ireland and perhaps an encouragement to the rest of us that continue to hold onto `old hurt’ as we continue to blast the darkness instead of lighting a candle. I want to now say something about the background of these two men to becoming witnesses in the disarmament process. 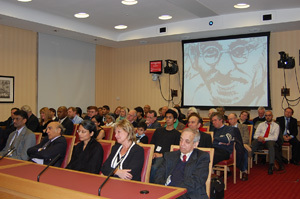 In all kinds of ways Harold Good has been involved in Gandhian causes. 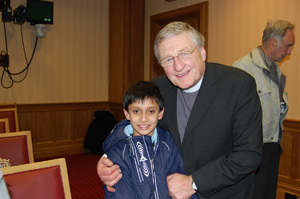 Born 1937 in Derry he was to follow his father into the Methodist ministry. He served as a probationary minister in the Dublin City mission in the 1950’s. He met his wife, Clodagh, whilst serving in Waterford. In the 60’s he served in Ohio and came into direct involvement with the civil rights movement. He served in the largely black Methodist church in Indianapolis and there he was to be deeply affected by the assassination of Martin Luther King. He made a connection between racism and sectarianism. In the course of his ministry he was active in the work of reconciliation and the resettlement of prisoners. He was the Director in the 70’s of the Corrymeela community., a centre for reconciliation between the communities. He was chair of NIACRO (Northern Ireland Association for the Care and Resettlement of Prisoners), part-time prison chaplain at Crumlin road prison, worked closely with both Republican and loyalist prisoners. A key part of the Good Friday agreement was of course the release and rehabilitation of all political prisoners. In 1999 he was able to take a sabbatical in South Africa and his life converged very immediately with the life of Gandhi. He attended the centenary of the Phoenix farm settlement outside Durban and met Gandhi’s granddaughter. He became close to Bishop Tutu and was inspired by the South African Truth Commission and became actively involved and remains so to this day in the equivalent Healing through Remembering project in Northern Ireland. 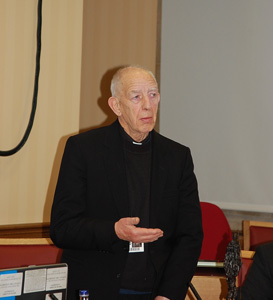 Reverend Good has become a recognised speaker on conflict resolution, invited for example to lecture to the Basques. The Basque government awarded him the Rene Cassin Human Rights award. 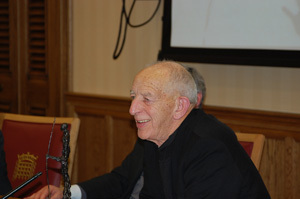 He and Father Reid were invited to give the John Hume lecture at the McGill University. He was awarded an MBE in 1970 and OBE in 1985. He was elected President of the Irish Methodist Church 2001-2. Brought up in County Tipperary he was professed as a monk in the Redemptorist order 1950 (the Redemptorists were founded in 1732, for mission work among the poor, and significantly refused to restrict their mission to just educational work) and in 1954 joined the Clonard monastery in Belfast, sited at the crossroads between the Nationalist Catholic community and the Protestant Shankill road. Here he was to spend the next 40 years. In the nature of his vocation this has been a more public than private life. In 1988 he gave the last rites to two Royal signals corporals who accidentally strayed into a republican funeral and were killed by the Provisional IRA. Father Reid has always been a committed opponent of violence. In this cause from the late 80’s onwards he engaged in talks between all the political parties, first facilitating a meeting between SDLP leader John Hume and Sinn Fein President Gerry Adams, meeting Charles Haughey in 1987 and thereafter involved discreetly in the political process right through to the Good Friday agreement of 1998. He has likewise been involved in the peace process in Basque Spain and in 2002 was awarded the Sabino Arana `World Mirror prize ‘by the Sabino Arana Foundation of Bilbao. He is currently based in Dublin. Although, recently he was not feeling too well we are delighted that he has come today. So, here was the background to the trust placed in them both as a witness to the decommissioning process. 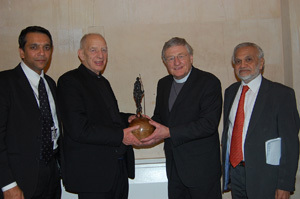 I would now like to ask Lord Bhikhu Parekh to present the Gandhi Foundation 2008 International Peace Award to Reverend Harold Good & Father Alexander Reid. Thank you … and thank you Father Alec for speaking on behalf of us both and for expressing so eloquently the immense sense of honour and privilege of which we are both so aware this evening. Following Our Part In The Verification of De-Commissioning . . . I hope he will be happy with the peace …. because there won’t be a lot else! More seriously, I can think of no greater gift that one generation could leave to another, than the gift of a world more at peace with itself than the one it inherited. I know that this is where we and Gandhi and this Foundation which bears his name will find common ground. We can all think of iconic figures of the 20th Century. People who have left their mark on the pages of history for many different reasons. Some for their music, some for their analytical insights and others for their scientific achievements. But of those who have made the greatest contribution to our understanding of how we are meant to resolve our conflicts and how we are to share life on this planet, the first names to come to mind will be those of Mother Theresa, Martin Luther King, Nelson Mandela and Mahatma Gandhi. Each of them in their own distinctive way has influenced us all, as they have influenced history. But of the four, the one whose life and teaching helped more than any to shape the thinking of the other three was, of course, Mahatma Gandhi. This year we have marked the 40th Anniversary of the death of Martin Luther King and the 60th Anniversary of the death of Gandhi. How ironic, that two relentless advocates of non-violence should both suffer such a violent death. Those of my age and above may remember something of that fateful 30th day of January, 1948 , when on our crackling wireless sets we heard of the assassination of this strangely clad, skeletal and bespectacled little man in the distant land of India. As a ten year old schoolboy I could not have understood the significance of that event and would have paid it little attention. For me it was many years later when I began to understand the impact of Gandhi’s teaching upon a world that lay well beyond the shores of either India or Ireland. By then it was the mid-sixties and I was living and studying in the then very turbulent and racially divided United States of America. During that time I was serving a black inner-city congregation – from whom I learned much more about grace than I did about race! But nothing prepared me for the task of ministering to those people in the week that followed the assassination of Martin Luther King. A week when everything he had preached and learned from Gandhi was put to the ultimate test. But a week in which America and the world was to see that no assassin’s bullet could destroy the dream. A dream which is unfolding before our very eyes during these final days of the American election. It was not surprising, that upon my return to Ireland in the late sixties I was to bring something of that experience into an inner city parish in the then turbulent Northern Ireland. It was on our first visit to South Africa that Clodagh and I stood on the railway platform in Pietermaritzburg where Gandhi , the Cambridge educated lawyer was ejected from the first class compartment for no reason other than the colour of his skin and his ethnic origins. This, of course, is where it all began. Those who flung him from that train could not have known that in that moment they were launching one of the most powerful movements in world history! Later we drove to Phoenix near Durban to see for ourselves the settlement where Gandhi established a model of community for fellow Indians who, like himself, had been marginalised in the country of their adoption. We had been invited to the dedication of a memorial to Gandhi, to be attended by the Prime Minister of India. Our host was responsible for the arrangements, and with a life-size marble bust of the Mahatma on the back seat we bumped our way to Phoenix. I have a wonderful memory of Clodagh and Gandhi hanging on to their seats, if not each other! Sadly, it rained all through the ceremony and when leaving our vehicle got firmly stuck in a sea of mud. We pushed and shoved with the help of a gracious man who I asked to help us … not knowing until we were both covered in mud that he was none other than the grandson of Gandhi himself! Having shared all of that, I hasten to add that these rich experiences do not make me a Gandhian expert. On the contrary, I am very conscious that I am in the presence of people who have already forgotten more than I will ever know about the Mahatma. So I will be cautious in my references! On a recent evening I watched a BBC documentary to mark the 40th Anniversary of the first Civil Rights March in Northern Ireland. It was entitled, “The Day the Troubles Began”. But as we all know, our troubles began long before 5th October 1968. As I watched the scenes of bloody confrontation between the peaceful protestors and the police, I looked at Gandhi on the cover of the book on my knee and thought how different our story might have been if long before 1968 we had taken time to hear what Gandhi had to say to Ireland, as well as to India. Not that the real Gandhi was the infallible ‘saint’ which many of his followers perceived him to be. Indeed, he would be the first to remind us of his own imperfections and of his personal vulnerability. So what was it about this enigmatic figure which made him an icon of the 20th Century? What is it about him that continues to bring people , such as ourselves, together on a night such as this, sixty years after his death? Again, Judith Brown. Returning to the theme of this evening, “Lessons for Peacemaking”, Gandhi offers two fundamental principles to those who would be serious about making peace. Firstly he said, “Be the change you want to see in the world”, reminding us of the need for personal integrity in the search for peace. This was the distinctive genius of Gandhi, he ‘lived the dream’. His words and actions were one, not two. In his lifestyle; his long marches; his going to prison; his readiness to fast unto death, there could be no doubt about his integrity as well as his intent. Secondly, in a world where people instinctively assume that violence is the only sure way to challenge and change an unjust order, or that physical force is the only way of dealing with civil unrest and insurgency, Gandhi insists that there is always another and a better way. This is where I want us to connect with the Irish Peace Process. “you have heard it said of old …but l tell you there is a new way”. The time had come when we knew there had to be another way. After thirty and more years of violence, the people of Ireland, North and South, Nationalist and Unionist, Catholic and Protestant, were weary of war. None more so than the victims and survivors of our conflict who would resonate with the words of Gandhi when he spoke of the awfulness and the futility of violence. Inevitably, the search for another and a better way begins with the acceptance of REALITY. And, as we know, reality can be painful. For Republicans, with their long history, the painful reality was that their political aspiration would not and could not be achieved through an never-ending armed and bloody struggle. For the British Government it meant acceptance of the reality that there was never going to be a military solution to the Irish problem. A reality about which Brigadier Crozier had written to Gandhi so many years before! . . . Why does it take us so long to learn from the lessons of history? But within those realities were other realities. None of which came easily to a people entrenched in history and engulfed in violence. For Unionists it was the acceptance of the right of Nationalists to equal rights of citizenship as well as their legitimate political aspiration. For Nationalists it was the acceptance of the right of Unionists to theirs. In the search for a better way one must offer to the other nothing less than one would ask for oneself. The ultimate reality was that this part of Ireland was home to people of both traditions, Nationalist and Unionist, Catholic and Protestant, who must finally find a way to live together. IF the acceptance of REALITY is the first step in the search for peace . . . the second is the need for DIALOGUE. This is not to suggest that there was no dialogue prior to the setting up of formal talks. While not widely publicised, throughout those violent years there was much informal dialogue which for many of us began on the streets of our cities in the darkest of days and nights. We continued that dialogue in Protestant parsonages and Catholic monasteries; in private homes and grass-roots movements where people of goodwill came together to share their fears and their frustration. For those involved, such gatherings provided an antidote to consummate hatred and dismal despair and sustained a vision of what ultimately was to follow. However, significant as it was, much of this dialogue was limited to conversations between like-minded people, none of whom would ever resort to violence as a way of resolving a dispute of any kind. The time had come for dialogue to include historic enemies. Something that would be resisted, but which people of goodwill were prepared to facilitate. In describing the dialogue which brought us to where we now are, I use the image of a curtained stage. There were three levels at which people talked, which I describe as …. By this I refer to ‘behind the scenes’, informal, unrecorded conversations for which no one would be held accountable. Opportunities for people from all sides of this conflict to hear one another, some for the very first time. As it had to be an HONEST dialogue it was not always an easy dialogue. While TRUTH can ultimately make us free, it can also be very painful. All too easily forgotten due to later events and the passage of time, was the courageous initiative on the part of Protestant churchmen who, in 1974, met secretly with the leadership of the IRA at a hotel in Feakle, Co Clare. Our history might have been very different had those talks not been abandoned after the unexpected arrival of the Irish Police in response to a tip-off! While it is of such conversations that Father Alec and I are most familiar, you will have noticed that we do not speak of them in any detail. Unlike others, there will be no ‘reveal-all books’! For honest dialogue there must be mutual trust…. a trust which is sacred and must never be betrayed. For me, and for others from my tradition, there were endless days of dialogue with those committed to the antithesis of the political position embraced by the majority of people from our part of the community. This was not an easy tension, but one we chose to carry discreetly within ourselves. I return to my image of the curtained stage. At the theatre, when curtains are pulled, the band plays and the leading players walk on stage, we are unaware of those who helped to shift the furniture, adjust the lighting and write the scripts. What matters most is what we see before us, and what is to follow. So it is in making peace. And rightly so. For those involved this was difficult, potentially politically dangerous and full of risk, for there is no definite outcome. In the 1980s an IRA re-armed by Libya intensified its violent campaign and the state was accused of “shoot to kill”. There seemed to be no end to the “Long War”. But behind those violent images was a secret ‘backchannel’ involving the British Security Services, a facilitator, Derry businessman Brendan Duddy, and Martin McGuinness. Having accepted reality, both sides knew that the only way out of this conflict would be through negotiation and dialogue. This is but one example of “off stage” dialogue where issues and potential are explored in private before arriving on the public stage. The third level of dialogue we describe as “ON STAGE”. Throughout the years there have been many much publicized initiatives, each of which it was hoped would break the deadlock and resolve our conflict. We remember most by name, if not in detail. The ‘Anglo-Irish Agreement’; the ‘Sunningdale Agreement’ ; the ‘Downing Street Declaration’. Usually these initiatives are described as “failed” or “ill-fated”. In my view they should not be, for each was followed by strenuous efforts to build on what had been learned. Here I pause to pay tribute to the leadership of David Trimble and John Hume who put process and peace before self and party and paid a high electoral price, but without whose vision and effort we would not be where we now are. An important lesson from our history is that to have any chance of success, dialogue must be inclusive. Father Alec’s simple but profoundly important image is of a ‘table’ around which all parties to a conflict are invited to sit, as equals. This was the basis of the talks chaired by Senator George Mitchell which led to the Good Friday Agreement. While Ian Paisley’s party and lesser known Bob McCartney chose to leave the table when Sinn Fein took their seats, their seats were kept for them while others sat through long days and nights until they arrived at agreement. To achieve consensus, there is an inevitable need for COMPROMISE. Those who would argue that ‘compromise’ is a doubtful if not ‘dirty’ word will know that no marriage or any meaningful relationship would survive without it! It is not without significance that the words ‘compromise’ and ‘accommodation’ share a common root. Therefore compromise, like accommodation, is about making space for one another. In the Good Friday Agreement there was much that was mutually acceptable to all of the parties. But there were highly contentious issues which could only be resolved through compromise. One such issue was the demand for the early release of ‘politically-motivated’ prisoners from both sides of our conflict, many of whom had been guilty of the most heinous of crimes. At that time I chaired an organisation that shared responsibility for the care and resettlement of prisoners of all kinds and we facilitated an informed debate on the issue. Amongst those who had difficulty with the concept of early release were people from the churches. 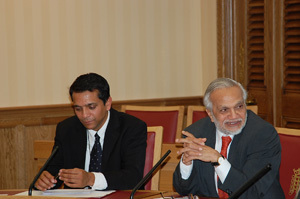 In addition to ‘reality’; ‘dialogue’; ‘consensus’ and ‘compromise’, every peace process needs visible ‘SIGNS AND SYMBOLS’. This was what lay behind the demand of Unionists, and of both governments, for the complete de-commissioning of the weapons of the IRA. For Unionists, they would not contemplate sharing government with Republicans until there was evidence of ‘deeds not words’. The historic Constitution of the Republican movement clearly forbids the surrender of one’s weapon. It speaks highly of the patience of Gen. John de Chastelain and his colleagues on the International Commission on De-commissioning that they were able to agree a process with the leadership of the IRA whereby their weapons would be put permanently ‘beyond use’ and ‘beyond reach.’ It was no surprise that the demand of Mr Paisley and the Democratic Unionists for photographic evidence was unacceptable to the IRA. The compromise was that two clerics, one Catholic and one Protestant, should be the ‘seeing eyes’ to verify what had taken place. Father Alec and I were entrusted with that task. While we do not speak of the detail of that exercise, neither of us will forget the moment when out of the shadows, a lone figure who watched over us during those days stepped forward and with military precision handed his weapon to General de Chastelain. To report what we had seen with our own eyes was conformation of a visible sign that as far as Republicans were concerned, ‘their war was over’. 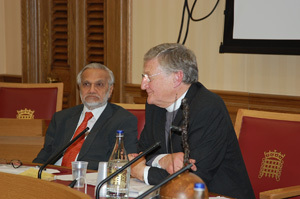 Other visible confidence-building measures included the implementation of the Patten Report on policing. A new name, new uniform, badges and insignia were very visible signs and symbols of a new Police which from now on would be fully accountable and representative of the whole community. And there were those remarkable images from May of last year when all of the parties took their seats in the new Stormont Assembly. For me the lasting image is that of First Minister, Ian Paisley, and Deputy First Minister, Martin McGuinness, going through the door of that building. Note the hand of one upon the arm of the other. This truly was ‘the hand of history’. And worth a thousand choreographed handshakes! These are but some of the ‘Lessons for Peacemaking’, from our story. We could go on to speak of the need for ‘HOPE’. In one of his biographies , Gandhi is described in the language of the Old Testament prophet Zechariah as ‘a prisoner of hope’. Without that dogged and at times stubborn quality of hope, every peace process would fall victim to despair. When I saw the cover of the Good Friday Agreement, I wondered did she remember what she wrote? I certainly did, for it was her letter as much as anything which prevented me from giving up. Today our children see sunsets instead of bombs. As a community we have faced and accepted realities; engaged in dialogue; achieved consensus; accepted compromise and witnessed the signs and symbols of peace. In the context of his beloved India, Gandhi wrote what would well describe what we have seen . . . But while lessons have been learned, we cannot sit back and assume that our schooling in the ways of peace is complete. It is the American poet Robert Frost who speaks of the temptation to retreat to what might appear to be a ‘safe’ place. Remembering what happened on the train at Pietermaritzburg, Gandhi would have rejoiced in hearing that. As a deeply spiritual person, who insisted that spiritual values should be the basis for political action, he would resonate with that need for a change of heart. As we observed the relationship between First Minister Ian Paisley, the man who consistently said “No” and “Never”, and Deputy First Minister Martin McGuinness, self-confessed commander of the IRA, there was clearly something more than a change of mind! As churches, we must accept responsibility for our part in our tragic history. But if part of the problem, we must now be part of the solution. And if we are true to what we preach, our distinctive contribution must be in the transformation of hearts and minds. Only when we dismantle the ‘barricades’ in our attitudes will the peace walls be taken down. It will be in the de-commissioning of our mind-set that we will set each other free from fear. But from the lessons of history, this is a journey from which we dare not turn back, not least for the sake of the child who wrote that letter and her children and theirs. So thank you for taking time to try and understand us, and please be patient with us as we continue our journey and share our story. I knew Harold Good in the early 80s when he was member of the Social Security Advisory Committee (SSAC) and I was a member of the committee’s secretariat. I still fondly remember what a wonderful man he was. I remember his ‘Good’ Tours’ of Belfast when SSAC held its meetings at Stormont. After retiring, I went to live in Ireland and I am an Irish citizen. I have read about the vital part he paid in the peace process in Ireland. I now live in Sri Lanka where there is an urgent need for a peace process. I am a freelance writer and would like to write a peace about Harold as I think it might interest Sri Lanka editors and readers and give them some food for thought. Is there any way i can get in touch with him.